Eating healthy can be beautiful! Eating healthy for a lifetime is a goal that should take importance over any dieting or weight loss goal. However, often we go on a diet, lose the weight, and then return to our former ways of eating…which is one of the ways we gain the weight back. Most experts agree that in order to break this “never-ending” cycle is to actually change the way you eat by changing your habits. So, how do you do this? How in the world will you be able to change your eating habits in a way that will keep you eating healthy forever? List foods in categories on your list. You want your “Produce” section to be at the top because it should have the most food listed under it. To make shopping easier, try to list categories in the order you come across them at the supermarket. Scrutinize each category on your list and skip the ones that aren’t very healthy (such as chips, pop and candy). Buy only healthy items at the store! Plan Meals in Advance – Grocery shopping will go much quicker if you plan your meals out for the week in advance. This is especially true if you’re trying to eat healthier meals. If you go to the grocery store without a plan for the meals you’ll be fixing next week, you’re more likely to end up with unhealthy “convenience” foods. So, save yourself time, money, and extra calories by planning your family’s meals in advance. 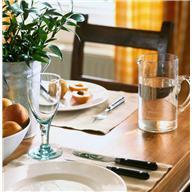 Visit Restaurants Less Often – Many of us have a tendency to eat out at restaurants at least 4 or more times a week. Why? For the majority of people, it’s because it’s easier to eat out than to prepare something at home. However, eating out not only costs you more money, but it also costs you a lot of unwanted calories and unhealthy fat and sugars, too. Try to limit your eating out to 1-2 times a week. If you look at the restaurant’s menu online before you go, you’ll be able to see the nutritional value for each meal. If you don’t get a chance to look before you go, you can always ask the waiter/waitress for it once you're there. This information will help you make healthier food choices when eating out. Hopefully these few tips have helped equip you in your quest to eat healthier, so don't give up! Small steps in the right direction are vital to your family's success in eating healthier for a brighter future! Come visit our community page on Facebook, and let us know what you've started doing to eat healthier!